The Daisypath site has been redesigned to make it easier to use on all platforms, and easier to share your tickers. In the My Daisypath section, you can display the ticker options either by hovering over the ticker (on a desktop computer) or tapping on the ticker (on a mobile or touch enabled device). You can share the tickers directly from the My Daisypath section page, or by clicking on Get ticker code. Site menu. Tapping on this displays a menu for Home, Help, News and My Daisypath . Account menu. 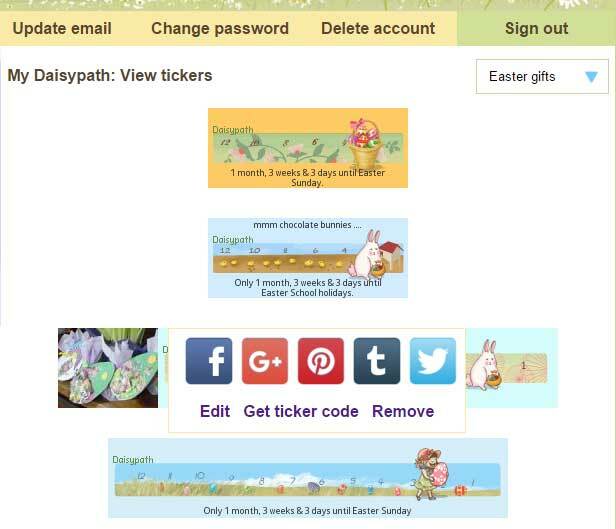 When you are in the My Daisypath section, this gives you access to account options such as My tickers, Update email, etc. Every page on Daisypath has been rewritten and retested, and all the help pages updated but it is always possible that I have missed something, so if anything doesn't seem to be working properly or doesn't make sense, please do let me know. 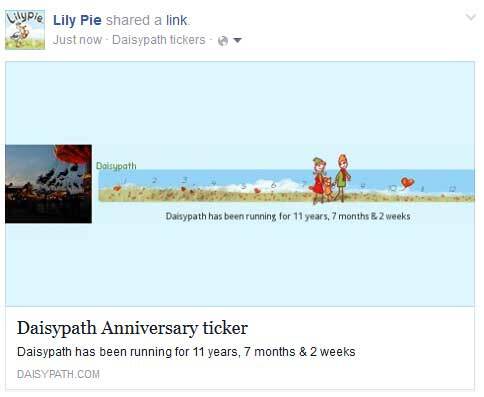 All the great feedback over the years has helped to keep Daisypath running for over a decade and I really appreciate it.